Today St Mary’s Cathedral is one of Australia’s most beautiful and significant buildings but it did not happen overnight. 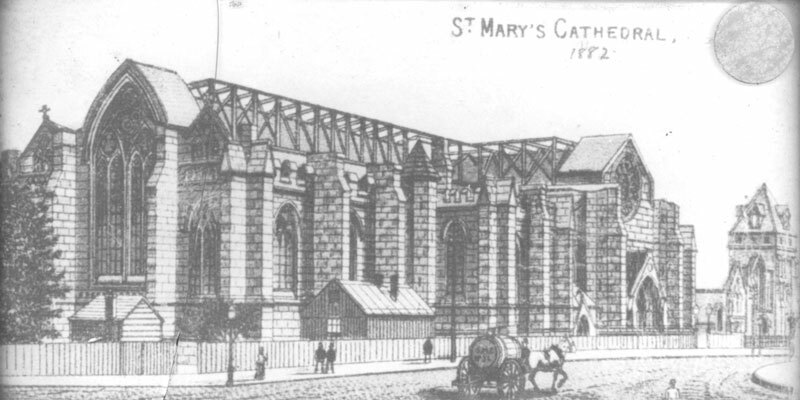 The Cathedral evolved through a long and patient timeline following a fire which destroyed the first St Mary’s Cathedral in 1865. 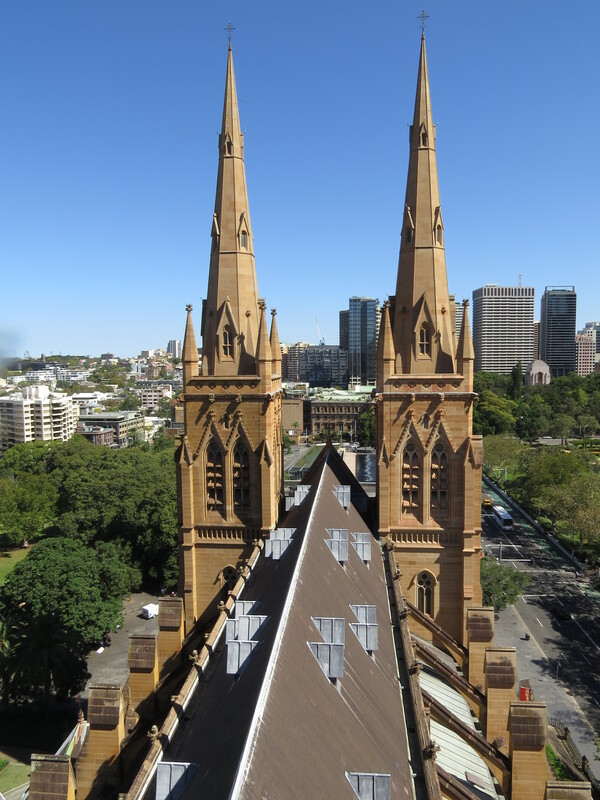 As Australia’s largest Cathedral building, this English-style Gothic revival building constructed of honey-coloured Sydney sandstone, is regarded as the Mother Church for Australian Catholics. Its central Sydney location ensures a strong and visual presence of the church in Australia’s largest city. Architect William Wardell was commissioned by Archbishop John Polding to design a new St Mary’s following the devastating fire in 1865 razed the original Cathedral. According to Archbishop Polding to Wardell in a letter dated 10 October, 1865: “Any plan, any style, anything that is beautiful and grand. I leave all to you and your own inspiration”. Despite the building’s European origins, Wardell used Australian native flora throughout as a decorative element to ground the Cathedral in its local setting. It took close to 100 years to finally complete St Marys with the first stage constructed between 1866 and 1900 and stage two between 1912 and 1928. However, the original Wardell design was only finally completed in June 2000 when the metal frames of the imposing Southern Spires were lowered into place by helicopter and then sheathed in Gosford sandstone. According to the former Archbishop of Sydney George Pell: “This beautiful Cathedral Church is many things: a historic building, an architectural wonder, a monument to the role which Christianity and especially the Catholic faith has played in Australian life from the first days of European settlement and a magnificent tribute to the faith and commitment of generations of Catholics.” Dedicated to the Blessed Virgin Mary, under the title of Immaculate Mother of God, Help of Christians, the Cathedral will celebrate its Sesquicentenary in 2018, 150 years since the laying of the foundation stone of the new Cathedral by Archbishop Polding. The First Fleet arrives and Sydney is founded as a British convict settlement. Catholics are among the convicts and the soldiers. The Cathedral is officially opened by Cardinal Moran. The Cathedral, complete with south nave, is opened. The first Pope to visit Australia, Pope Paul VI celebrates Mass in the Cathedral. The peal of 14 bells is consecrated. The southern spires are installed, complete from Wardell’s design. Pope Benedict XVI visits Sydney for the 23rd World Youth Day. 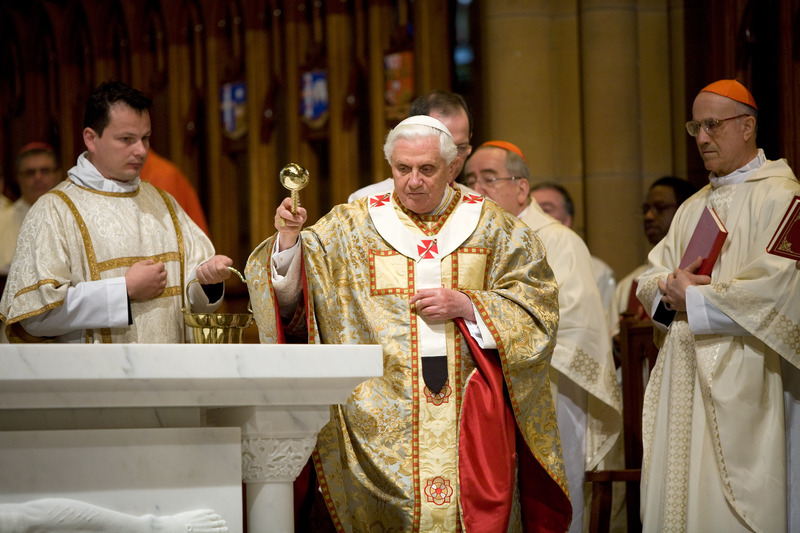 During the festival, Pope Benedict XVI dedicated a new Altar for the Cathedral. Blessed Mary MacKillop is canonised in Rome and given the title of St Mary of the Cross, thus becoming Australia’s first Saint. Cardinal Pell unveils a statue of St Mary of the Cross at the Hyde Park entrance of the Cathedral. Pope Francis appoints Cardinal Pell as the first ever Secretariat for the Economy at the Vatican. Bishop Anthony Fisher OP is appointed as the ninth Archbishop of Sydney on 18th September. His installation took place on November 12th.